Find-a-Grave Memorial 42583133. Edward died from heart failure in Lima, Ohio at the home of his daughter Elvy. He is buried in the Shawnee Cemetery of that city. Obit article states he has two daughters – then living: Elvy Harmon and Lena Barnes. 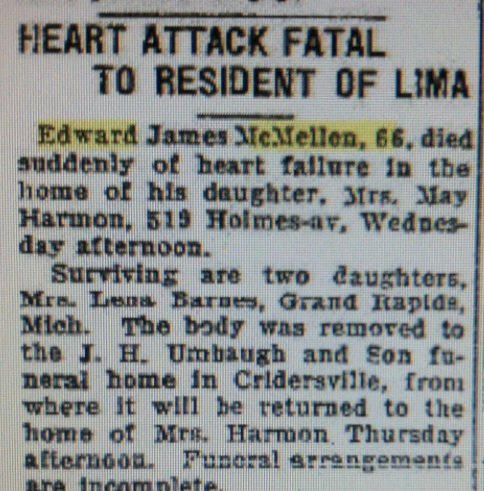 Edward James McMellen died at Lima, Allen County, Ohio on 27 April 1932 from organic heart disease. Edward’s daughter Elvy was the informant: the certificate does contain errors. Edward is marked as being divorced from Mrs. Grace McMellen. He worked as a general laborer and was 65 years, 11 months and 1 day at time of death having been born on 26 May 1866 at St. Joseph, Michigan. Edward’s parents are listed as: John McMellen, born in Michigan; and Fannie Farr, birthplace unknown. Neither of which is correct. Edward was buried in the Shawnee Cemetery in Ohio. “Ohio Deaths, 1908-1953,” database with images, FamilySearch (https://familysearch.org/ark:/61903/1:1:X69S-TJK : 8 March 2018), Edward James Mcmellen, 27 Apr 1932; citing Lima, Allen, Ohio, reference fn 21207; FHL microfilm 1,992,571. 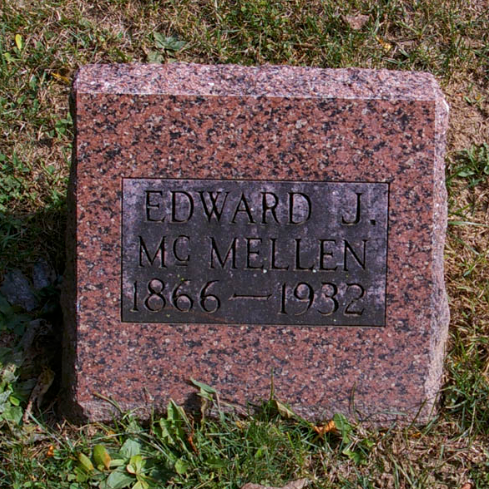 In 1930 Edward McMellen was living with one of his daughter’s families in Grand Rapids, Michigan at 76 Mt. Vernon. “United States Census, 1930,” database with images, FamilySearch (https://familysearch.org/ark:/61903/1:1:XQBF-YC1 : accessed 25 August 2018), Edward Mcmallen in household of Sherman Barnes, Grand Rapids, Kent, Michigan, United States; citing enumeration district (ED) ED 25, sheet 20A, line 36, family 220, NARA microfilm publication T626 (Washington D.C.: National Archives and Records Administration, 2002), roll 1000; FHL microfilm 2,340,735. In 1920 Edward McMillian [sic] was living with his brother John and family at 17 Gold street in Grand Rapids. He worked as a laborer for a bedding company. For further information on this census select John from the main page. “United States Census, 1920,” database with images, FamilySearch (https://familysearch.org/ark:/61903/1:1:MZ3Y-993 : accessed 26 August 2018), Edward Mcmillian in household of John Mcmillian, Grand Rapids Ward 1, Kent, Michigan, United States; citing ED 33, sheet 9A, line 8, family 208, NARA microfilm publication T625 (Washington D.C.: National Archives and Records Administration, 1992), roll 777; FHL microfilm 1,820,777. In 1910 Edward McMellen living in Wyoming, Michigan, just south of Grand Rapids, with a boarder. Edward was 43 and born in Michigan. He is listed as being Single. This census is incorrect in that it lists Edward’s father as being born in “Scot English”. Edward works as a section hand for the railroad, as does his 23 year old boarder. “United States Census, 1910,” database with images, FamilySearch (https://familysearch.org/ark:/61903/1:1:ML5P-VPV : accessed 26 August 2018), Edward Mcmellen, Wyoming, Kent, Michigan, United States; citing enumeration district (ED) ED 148, sheet 15B, family 337, NARA microfilm publication T624 (Washington D.C.: National Archives and Records Administration, 1982), roll 656; FHL microfilm 1,374,669. Husband and Wife Make Serious Charges in McMellen Case. 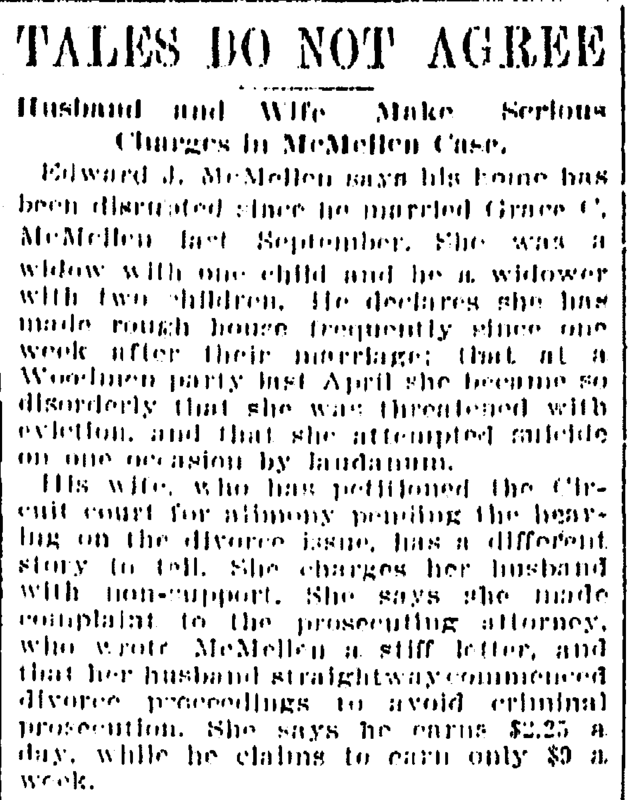 Edward J. McMellen says his home has been disrupted since he married Grace C. McMellen last September. She was a widow with one child and he a widower with two children. He declares she has made rough house frequently since one week after their marriage; that at a Woodmen party last April she became so disorderly that she was threatened with eviction, and that she attempted suicide on one occasion by laudanum [tincture of opium]. His wife, who has petitioned the Circuit court for alimony pending the hearing on the divorce issue, has a different story to tell. She charges her husband with non-support. She says she made complaint to the prosecuting attorney, who wrote McMellen a stiff letter, and that her husband straightway commenced divorce proceedings to avoid criminal prosecution. She says he earns $2.25 a day, while he claims to earn only $9 a week. 1905 Remarriage of former wife Rosa. Rosa McMillen requested a license to wed Elmer Marion Houseworth in 1905 at Payne, Pauling County, Ohio. He was 33, she 32. She was born in Wiley County, Indiana to Anderson Biddle and Mary Lewis. She was then divorced. “Ohio, County Marriages, 1789-2013,” database with images, FamilySearch (https://familysearch.org/ark:/61903/1:1:X889-BGM : 10 December 2017), Elmer Marion Houseworth and Rosa Mc Mellen, 06 Apr 1905; citing Paulding, Ohio, United States, reference vol7, p225, cn467; county courthouses, Ohio; FHL microfilm 925,302. Edward McMellen, age 38, married Grace C. Gramire Rogusta, age 33, at Grand Rapids, Michigan on 21 September 1904. Edward is listed as a laborer: his father Cornelius McMellen, his mother unknown. The couple were wed by Chas. McHarness, clergyman. Witnesses were Edward’s brother John McMellen and his wife Emma. “Michigan Marriages, 1868-1925”, database with images, FamilySearch (https://familysearch.org/ark:/61903/1:1:N368-9N5 : 15 May 2018), Edw Mcmellen and Grace C Gramire Rogusta, 1904. Elva May McMellen was born on 11 May 1895 at Blue Creek, Paulding, Ohio to J. E. McMellen and Rosa Bidle. “Ohio, County Births, 1841-2003,” database with images, FamilySearch(https://familysearch.org/ark:/61903/1:1:VR9N-Y7M : 13 March 2018), Elva May Mcmellen, 11 May 1895; citing Birth, Township, Paulding, Ohio, United States, county courthouses, Ohio; FHL microfilm 925,298. Lina G. McMellon was born on 8 March 1892 at Blue Creek, Paulding, Ohio to E. J. McMellon and Rosa B. Biddle. “Ohio, County Births, 1841-2003,” database with images, FamilySearch (https://familysearch.org/ark:/61903/1:1:VR9N-1H6 : 13 March 2018), E.J. 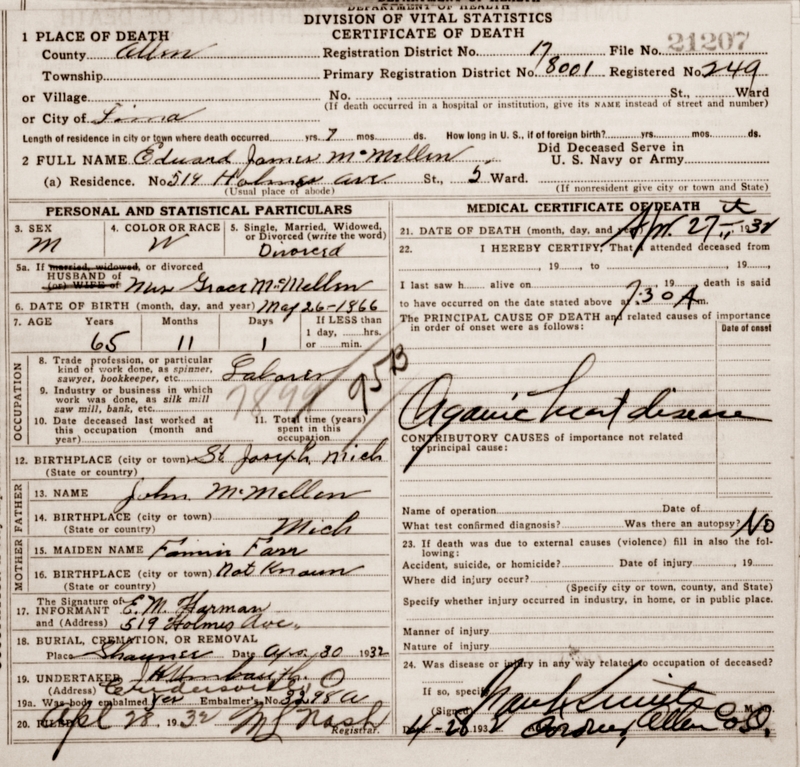 Mcmellon in entry for Lina G. Mcmellon, 08 Mar 1892; citing Birth, Blue Creek, Paulding, Ohio, United States, county courthouses, Ohio; FHL microfilm 925,298. E. J. McMillen married Rosa Biddle on 23 November 1890 at Paulding County, Ohio. “Ohio, County Marriages, 1789-2013,” database with images, FamilySearch (https://familysearch.org/ark:/61903/1:1:X8Z1-9R8 : 10 December 2017), E. J. Mcmillen and Rosa Biddle, 23 Nov 1890; citing Paulding, Ohio, United States, reference Vol 4 p 377; county courthouses, Ohio; FHL microfilm 925,301.